The theme for this year's Seattle Design Festival was Trust. Our concept revolved around the question "can you trust what you are seeing?" Whether it's politicians, news, social media, or advertising, we are increasingly reliant on others to present the world around us. The ability to trust what we see is bombarded daily by fake news, alternative facts, curated lifestyles, and reality television. Even our internet search results reveal information that is curated in a way that few understand. For our project we wanted to make an analog analogy of this very recent and tech-centric phenomenon. To get perspective on the current state of affairs, we looked back hundreds of years to the very beginning of our attempts to present the visual world "as it is." 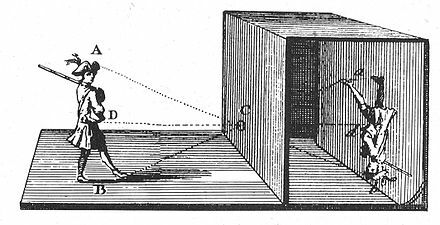 The primary parents of modern photography, the first camera obscuras, were pinhole projections in darkened rooms or tents. There are some theories that these projections, intentional or not, lead to the very first cave paintings. By the 16th century, lenses were being used to increase their brightness and add the ability to focus. As the projections became larger and more clear, public viewings began to elicit reactions of awe and disbelief. It was this kind of reaction that we wanted to evoke from our present day visitors. Today almost everything we see that is not directly observed, is unconsciously perceived as being reproduced through digital means, and in most cases it is. With this project we wanted to see if a simple and ancient trick of light would induce delight, or have we become too jaded by our glut of digital means of observation to find such things interesting? The overall reaction was definitely one of wonder. Across all ages there was a sense of discovering a new way to view the world. Many of the younger visitors would run outside and jump up and down yelling to their parents or friends “can you see me? !” once they knew what was happening. We had a continuous line of visitors for the entire two days. Many asked how it worked. Some asked where the projectors were. Some came out and said some version of “at first I didn’t understand what was interesting about this until I realized what I was seeing.” We were thanked and quizzed and the inquiries did not stop. There was something beyond interest, people were excited and wide eyed, as if they were seeing something new. To sit in a darkened room within a public space busy with people, sights and sounds, and just observe was both meditative and, unintentionally, a little disorienting. Since the enclosure was light fast but not sound proof the sounds you would hear would be directly opposite from the images you were seeing. It helped to reinforce the understanding of the images as projections of a world outside that was still behaving by the normal rules. 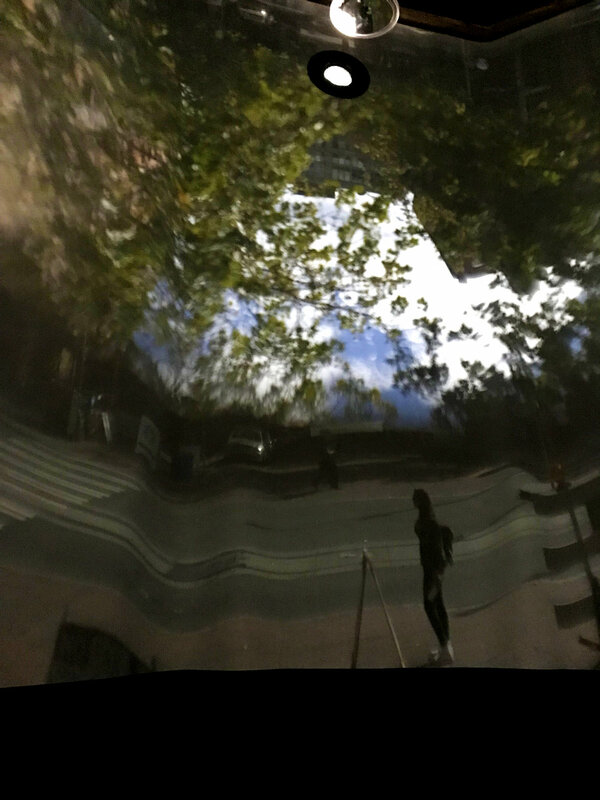 Inside, the projections overlapped, people disappeared and reappeared, cars ran over ripples in the fabric like Dali-esque speed bumps, some were right-side up and some were up-side down, a composition of light rendered into unending dynamic scenes. The design of the tower itself was intentionally a little ominous, though we hope still beautiful, as an object siting in a remarkable urban space. We wanted it to look as though it was an observation tower. Tall and at the head of the square it looked out across the Design Festival. It drew people to it but it also subtly let you know that it was looking back (or at least the people inside were). Today we have become accustomed to being observed. In some cases we take it for granted. In this instance we wanted the people on the outside to feel as though they were being observed and the people inside to delight in doing so. We separate ourselves in our own ways. Our current tools allow us to see more of the world than ever before but the perspective is not always ours. While our amazing technologies can bring us together they also can reinforce physical separateness. This weekend an ancient technology allowed us to gain a new perspective on the way we observe and are observed, the way we see the world and ourselves.